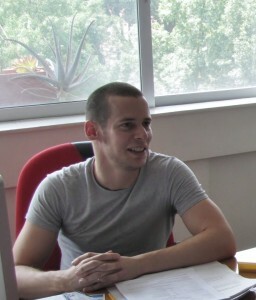 Carlos Gershenson is a Mexican researcher. He has a wide variety of academic interests, including self-organizing systems, complexity, artificial life, evolution, cognition, artificial societies, robotics, and philosophy. He is a full time researcher and head of the Computer Sciences Department of the Instituto de Investigaciones en Matemáticas Aplicadas y en Sistemas (IIMAS) of the Universidad Nacional Autónoma de México (UNAM). He is also a researcher at the Centro de Ciencias de la Complejidad (C3) of the UNAM. I am Editor-in-Chief of Complexity Digest, Book Review Editor of Artificial Life, and Complexity-at-Large Editor of Complexity. Carlos did a PhD on “Design and Control of Self-organizing Systems” at the Center Leo Apostel for Interdisciplinary Studies of the Dutch-speaking Free University of Brussels. His homepage from that period is here. He studied the MSc in Evolutionary and Adaptive Systems in the School of Cognitive and Computer Sciences (COGS) of the University of Sussex (2001-2002). His thesis was titled “A Comparison of Different Cognitive Paradigms Using Simple Animats in a Virtual Laboratory, with Implications to the Notion of Cognition“. You can find his webpage from that period here. Before that, he did a BEng in Computer Engineering at the Fundación Arturo Rosenblueth in Mexico City (1996-2001), from which his thesis was “Artificial Societies of Intelligent Agents”. During this period he also collaborated with Jaime Lagunez’s group at the Instituto de Química, UNAM and coursed five semesters of Philosophy at the Facultad de Filosofía y Letras, UNAM. You can connect with him on Twitter here. 1. Can you briefly describe your field of research? I work with self-organizing systems. These are systems that do not have a central control, but find solutions to problems by local interactions, just like many social animals such as ants, bees, schooling fish, flocking birds, and herding mammals. Self-organizing systems are useful for problems that are difficult to specify and/or are changing constantly. Instead of designing a solution that will be inadequate or obsolete, when we build self-organizing systems we focus on designing interactions, so that elements constantly seek solutions for unknown problems. So when the problem changes, the system adapts itself. 2. What fascinates you about cybernetics/systems research/system theory? Its ability to describe different phenomena with the same language. You can describe anything as a system, as an agent, or as information. These are simply different descriptions of the same phenomena, but abstracting from their material substrate cybernetics and systems research can find commonalities across systems at different scales, e.g. quantum crystals, hearts, and public transportation systems. When we understand that a change of description does not affect the phenomena described, we can search for different descriptions seeking usefulness, not truth. This lifts a severe obstacle that a Platonic worldview still holds many disciplines with. 3. Where do you see or would like to see the field heading? What changes would you like to see? The systemic worldview has already spread across all disciplines. However, there are still different languages used in each discipline. I think that this is to a certain point necessary, but I also see people being more open to working in interdisciplinary groups. There is also a big philosophical impact that systems research is having, that still has to become mainstream. Edgar Morin is one great example of the efforts within philosophy towards a better understanding of our world using the systemic worldview. 4. What impact does your field of research have on society? What practical application for society does it have? Do you see practical applications in your own life? Can you give examples? I am constantly applying my work to solving social problems. We have used self-organizing systems to coordinate urban transportation systems, such as public transport and traffic lights. For example, self-organizing traffic lights reduce on average waiting times by 50%, compared with traditional methods. This improvement can lead to benefits for millions of people, reducing costs, travel times, stress, pollution, and greenhouse gases. We are starting a project to understand how non-communicable diseases spread across social networks. As with the transportation systems, since the majority of the population would be benefited, even a small improvement would make a big difference. And it seems we can make big improvements. 5. What’s a scholar/writer, whose work inspires you in your own work? I am inspired by people who dare to think different and manage to get it right. Examples from the 20th century include Alan Turing, Ludwig Wittgenstein, W. Ross Ashby, Stuart Kauffman, and Steve Jobs.